Attach file (STL or BSB) Sending Model or Impression for scanning) From 3M Connection Center 3Shape Communicate No Source needed. Specify the source to be used. Note: If you are using BlueCam (NOT OmniCam) to scan the model, there are known scan accuracy issues for the full arch scans. NEW - Clear is Back!! - CT Scan MUST be open bite - Closed bite will cause issues with guide fit and design. Take CBCT Scan of the patient with an open bite, ideally the full arch. Either take an impression or intraoral scan of arch(s) or CT scan of the Stone Model. Yes - Qty 1 ($12 Additional) Yes - Qty 2 ($24 Additional) Yes - Qty 3 ($36 Additional) Yes - Qty 4 ($48 Additional) Yes - Qty 5 ($60 Additional) Yes - Qty 6 ($72 Additional) Yes - Qty 7 ($84 Additional) Yes - Qty 8 ($96 Additional) Yes - Qty 9 ($108 Additional) Yes - Qty 10 ($120 Additional) No - I have my own tubes. You import the CT scan (Dicom), place the implant(s), then send the Blue Sky Plan file and STL of the model or model for scanning to us. Below is for Hand Piece and bur not in Blue Sky Software. Not needed if you have selected a system above or using Blue Sky Burs with listed Hand Piece. What Brand of Hand Piece? Treatment Coordinator Implant Demo Model used to show your patients how the procedure occurs. Includes Model / Guide / Crown Bridge. 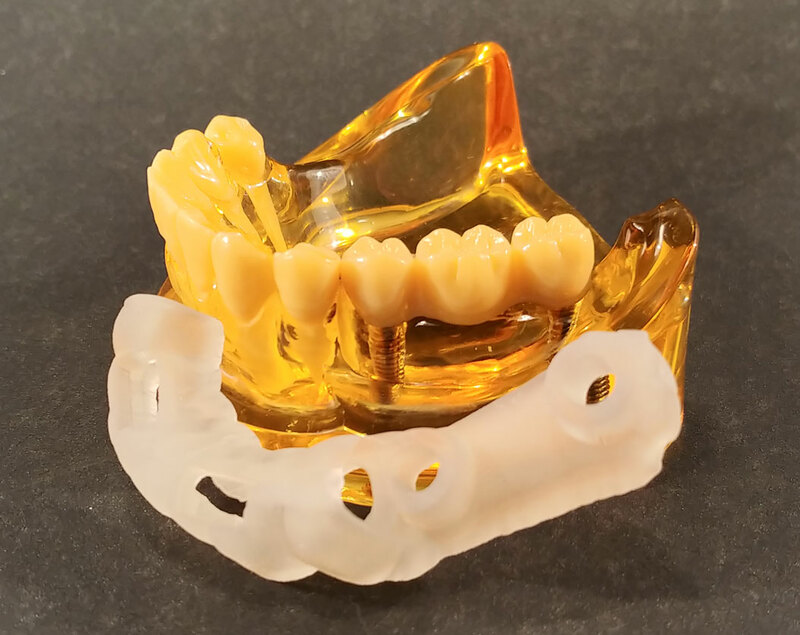 Implant Demo Model (Qty needed)? Upper Lower Both Which Arch(s)? Have us do a little or all of it or something in between. First Class Mail ($9.00 Additional) Time 7 to 30 days based on location DHL Express ($45.00 Additional) Time varies based on location. Notes to be used by the DOCTOR for this case. Any special instructions for the Lab. Invoice will be sent to you when the order has shipped. No Payment will be captured here. At the bottom of the invoice is a link for paying online.